....that second FFV piece is so hot I just can't even. I know. I really need to get my muse back and continue that Faris/Lenna star-crossed romance story. Poor Faris. She was all set to woo the princess, and then... DANGIT! You forgot the men who dress like ladies. Sadly, you are right. FFV's "Butz" obviously falls under that category, but the "Enough expository banter" baddie didn't see fit to single him out for commentary during their pre-showdown taunt exchange. Possibly the best Final Fantasy VII cosplay ever? Cloud Strife, Diamond Tiara edition. 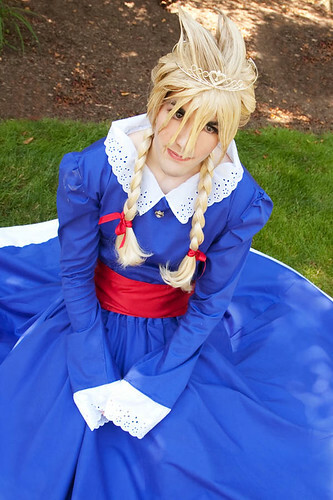 Oh, crossdressing Cloud, you are the best Cloud!